We love to experiment. And what better way to experiment with than nail polish? It lends your nails a touch of oomph and glamour. But that’s only if it’s done properly. We are here to make sure that every time you apply your nail polish it looks phenomenal. Just follow these simple steps! Step 1 – Start with clean nails. If you have scraped off your previous nail polish, use a nail polish remover before you proceed. Even if you haven’t got any nail polish on, a remover is a great way of cleansing your nails completely. Step 2 – Apply a base coat of clear nail polish. If you want nails with a professional finish, a base coat is a must. This makes your nail polish more resistant to chipping and provides an even base for application, keeping it looking flawless for longer. Step 3 – Dip your brush in the nail polish bottle (color of your choice) and remove the excess on the rim of the bottle. Apply a small dollop (almost the size of a dot) on the center of your nail, close to the cuticle. Step 4 – With your brush, push the dollop a little closer to your cuticle. Don’t worry if it gets on your skin, nail polish is made to adhere to your nails and not your skin. Step 5 – Drag your brush across the middle of your nail till the tip. Ensure that you have enough polish so that you don’t have to go over the stroke. Step 6 – Lift your brush and in one swift motion, apply it to the right side of your nail, dragging it to the tip. Always remember to start at the cuticle and use the dollop of polish in the center. 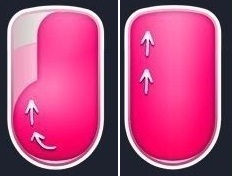 Step 7 – Repeat the same with the left side of your nail. Again, start at the cuticle and go to the tip. Now check to make sure that all parts of your nail are covered and repeat it with all your other nails. Step 8 – Wait for your nail polish to dry and then follow up with a second coat. Once the second coat dries, apply another coat of clear nail polish (top coat) to seal in the nail polish. Put your hands in water before your nail polish is dry. 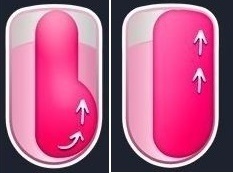 Water will remover your nail polish or cause it to chip. Add nail polish remover to your nail polish to thin it out. This may make your nail polish thinner temporarily, but it will get very sticky and unusable later. Invest in a nail polish thinner instead. For the first coat, try to limit the strokes to 3. If there are any gaps or flakes, they can be taken care of by the next coat. Borrow a nail polish from a friend. However close you may be, chances are your skin tones won’t match. So the way the nail polish looks on her hands may not be the result you achieve! Start by applying your nail polish on the thumb. By the time you are done applying polish to rest of your nails, the polish on your thumb nail starts chipping because of its angle. Always apply a top coat. You can choose to skip the base coat, but the top coat is a must! Remove any spills on your cuticles and hands using an ear bud dipped in nail polish remover. Keep your bottle closed at all times, to keep your nail polish in good condition for longer! Hold the brush with your thumb and middle finger. Keep the index finger on the top of the brush to give it direction. If your nail polish chips in one part, dip an ear bud in nail polish remover, and remove the polish only in that area. Then reapply.